Cully Hamner is a comic artist who has built up a very impressive reputation since he started working professionally back in the early nineties. He first got noticed on DC’s Green Lantern: Mosaic series and early on in his career, he worked in Atlanta’s famous Gaijin studios with the likes of Adam Hughes, Tony Harris, Brian Stelfreeze and Dave Johnson. He has worked on a cross section of books for publishers like Marvel and DC on titles like Daredevil, Convergence: The Question, Action Comics and The Flash. Most recently, Hamner has been drawing DC’s Batman And The Signal, a three issue miniseries written by Scott Snyder and Tony Patrick. Hamner has a unique and distinctive style as an artist which has won him many fans over the years. 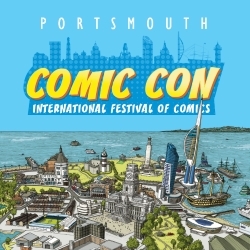 Portsmouth is the first time he has attended a UK comic convention.